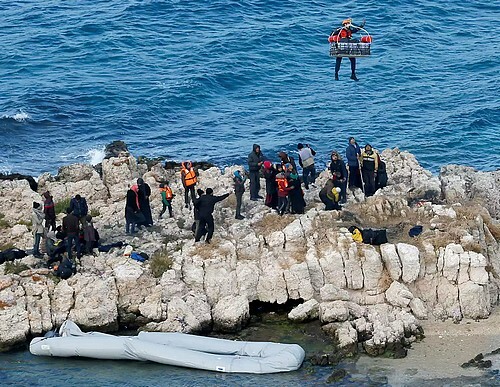 Yesterday there was a dramatic rescue operation by the Turkish coast guard in the Aegean Sea of at least 51 people who were stranded on the rocks while trying to cross Greece. When help comes from above, we get it early, yes it is. Because so we live the moment. With head lifted towards the missing light and an anxious gaze of seeing the clouds of our evil fate broken by miraculous remnants of supporting humanity. When help comes from above, it's a big feeling, in the heart and in the outstretched hands. But even when it comes to the side, or even from the bottom. It happens more often than you can imagine, you know? It doesn’t make news or even history. On the contrary, when from higher levels, living empathy becomes flesh, well, it’s a magical precedent that changes everyone's story. Of the saved and the savior. The first cannot help but rejoice at the idea that there really is someone, up there, in the earthly, and more than ever terrestrial, paradise beyond the impassable boundaries and last minute walls. A virtuous scenario that gives comfort to the hopes hit by daily suffering reveal itself from nothing. Well, good news, since it’s worth trusting the likeness of soul and body. We will not be perfect like the rest of the creatures, faithful daughters of mother nature, but there is still something to bet on. Because when the help comes from above, it takes very little to define it as such. Even a non-hostile look is honey for the heart. A smile is worth a billion possible moments of common peace, read it as the official currency of the horizon-less humans. Even words that don’t exclude and honestly draw the contours of the unknown beings landing from the wrong shore, they sound pleasing. Indeed, when the story becomes inclusive of the inevitable reasons of others, well, thank you. Whether you come from the Olympus to the north of mere survival, we thank you. Since this is help from above too. Nonetheless, it’s always a matter of simple perspectives and if you turn the story over, like the world, everything seems clearer. When you help those below. When we help those below, compared to us, it’s because we have remembered them in advance, aware of the reverse side of the fortuitous medal. Because in that way, we live the present moment, on each side of the latter. With the head always attentive to those who don’t get accounts of excess light, which we enjoy only for presumed birthright. That's why if you help those who are at the lowest point of fate, it's a big feeling, in the heart and in the outstretched hands. That’s how all of us, above or below, become equivalent, and only what really matters remains, that is, we all.